As awareness of non-binary gender identities has developed, some members of the queer community have chosen to identify as pansexual rather than bisexual. Pansexuality is sometimes defined as attraction to people of all genders, which is also the experience of many bisexual people. More often than not, however, people define their pansexuality in relation to bisexuality. In response to the question: “What does pansexual mean?” I’ve seen countless people reply: “I’m attracted to people of more than two genders. Not bisexual.” The implication is that bisexual means binary attraction: men and women only. Since I came out in the late 90s, I haven’t seen one bi activist organisation define bisexuality as attraction solely to men and women. Bi and trans* issues began to grow in recognition at the same time. When I use ‘bi’ to refer to two types of attraction, I mean attraction to people of my gender and attraction to people of other genders. I also frequently see cisgender pansexuals managing to be both transphobic and biphobic in their definitions. They say pansexuals are different to bisexuals because pansexuals are attracted to “men, women and transgender people,” as if binary trans people aren’t really men and women, and bisexuals couldn’t possibly be attracted to them anyway. Despite the presence of bisexuals at every queer demonstration since Stonewall, we’ve always been told by the lesbian and gay community that we’re somehow not queer enough. This pushes many bi people who are active in the queer community to identify as lesbian, gay or just queer. Being forced to pick a closet by both the straight and gay communities results in bi people having significantly higher rates of mental health problems than straight and gay people. This is why it’s so upsetting to see internalised biphobia leading many pansexuals, most of whom until recently identified as bisexual, telling us we’re still not queer enough. Gay and straight people aren’t being pressurised into giving up the language they use to describe their attractions and neither should they be. As usual it’s only bisexuals being shamed into erasing our identities and our history. The most frustrating thing to me about the current bi vs pan discourse is that it’s framed as a cisgender vs genderqueer debate. This has never been the case. In reality, many genderqueer people identify as bisexual. At least three of the most influential bi activists, researchers and academics are genderqueer. Meg John Barker, founder of BiUK; Jen Yockney, founder of ‘Bi Community News’; and Shiri Eisner, author of ‘Radical Bi: Notes For a Bisexual Revolution’, are all non-binary. They’ve spent years at the forefront of campaigns, lobbying for queer rights. To say bisexuality is binary erases the identities of these revolutionary bisexual genderqueer activists, and it erases the identity of every marginalised genderqueer bisexual they’re fighting for. I have no problem embracing more labels to better describe our attractions and our gender politics. We all have every right to use the labels that fit us. Some people identify as both pan and bi depending on context, but I can’t consider doing this before the implicit and explicit biphobia within the pan community is rejected. If your definition of pansexuality relies on redefining my bisexuality and negating it, I can’t support that. If you need to prove your queer credentials by vehemently clarifying that you’re not bisexual, you’re doing to me exactly what the lesbian and gay community does to both of us. A fascinating Ted talk arguing that most people are somewhere between completely gay and completely straight. Good to hear the Kinsey idea given some new energy. 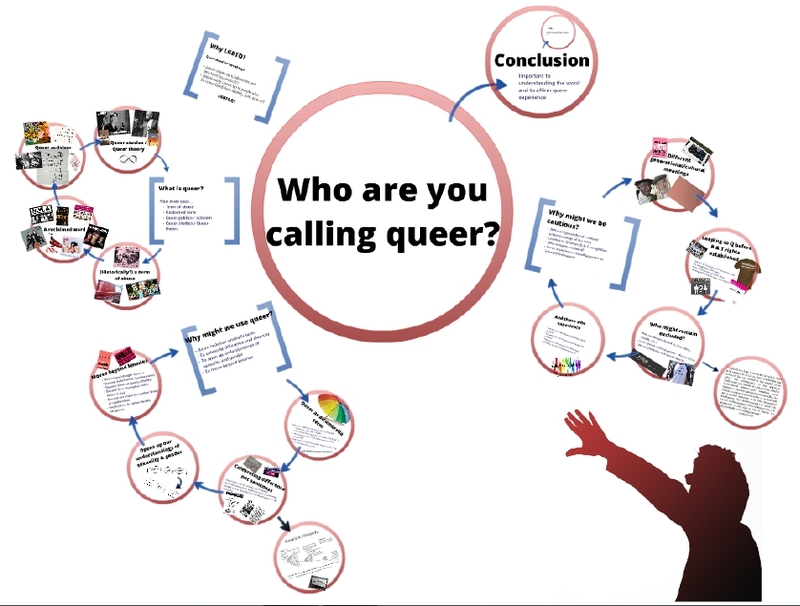 There’s a prezi presentations from Meg here on what queer means and why it might be useful for practitioners and others to engage with it. It covers queer as an insult, a reclaimed word, a form of politics and a kind of theory. Reasons we might usefully engage with queer include the way it opens up LGBT to various sexualities, genders, relationships and practices which are outside heteronormativity but don’t fit within LGBT, and the challenges it presents to binaries of gender and sexuality (man/woman, gay/straight). However, the associations that some may have with queer (due to their generation or culture, for example) as well as the potential it has to erase bisexuality, mean that it is worth being careful in the ways in which we employ queer. 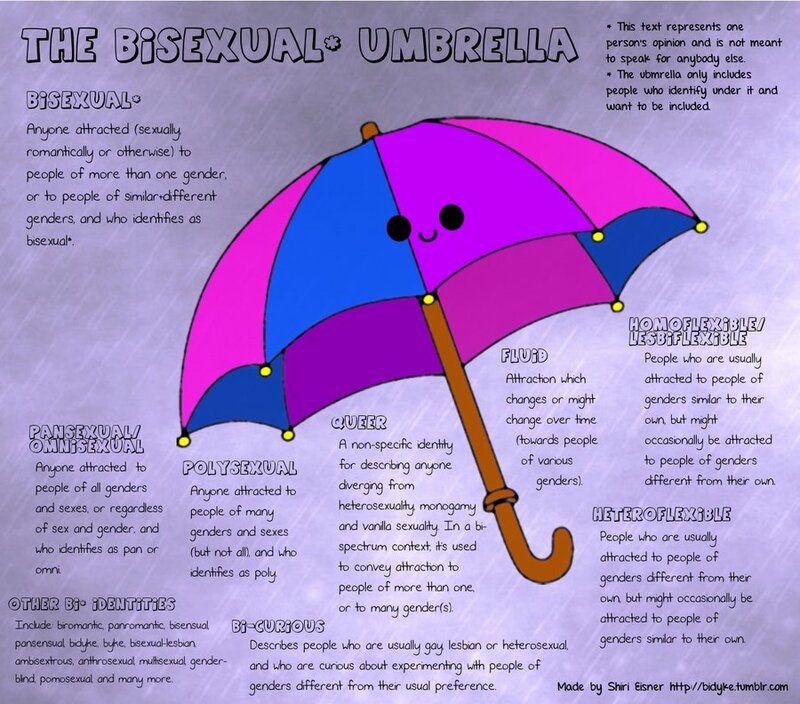 Who do we include under the bisexual umbrella? One of BiUK’s favourite bloggers created this nice illustration of who might be there. You might also check out the piece we wrote a while back about LGBT and queer umbrellas. Over on Radical bi there is a very sophisticated analysis of the kind of myth-busting people generally do on websites and other information about bisexuality. Generally speaking we tend to collect together biphobic myths (bisexual people don’t exist, bisexual people are greedy, bisexual people need to make their minds up, bisexual people choose to be bisexual) and provide evidence why these are wrong. Radical bi argues that we may do this to try to make bisexuality more palatable to dominant, mainstream culture. Perhaps it would be more radical to acknowledge the ways in which bisexuality does challenge the current status quo and find new, more celebratory, ways of responding to these myths. For example, rather than countering the myth that bisexual people are confused, we could celebrate the capacity of bisexual people to embrace uncertainty, and also we could celebrate the doubt that bisexuality raises about current dominant ways of conceptualising sexuality (that it is all about gender of attraction, and that there are only two possible sexualities). We still feel that there is space to challenge some of the myths which circulate about bisexuality, but it is definitely also useful to ask ourselves where these myths are coming from, who we are speaking to when we challenge them, whether simply dismissing them may reinforce them in some ways, and whether there are other ways to creatively engage with them.